In addition to spherical ice molds that claim to cool a drink without watering it down, there are also several products that claim to cool without melting at all, and therefore are incapable of watering down a drink. 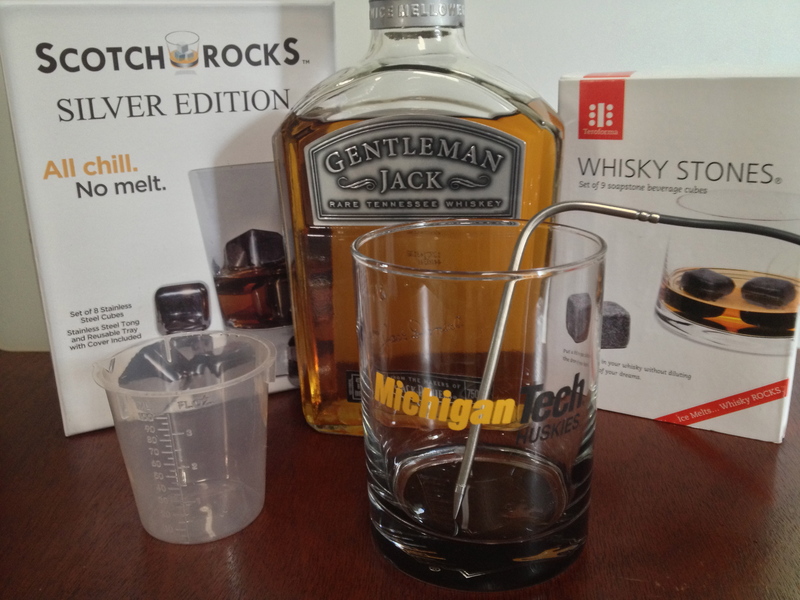 Stainless steel Scotch Rocks (back left), Gentleman Jack Whiskey (back center), Whiskey Stones (back right), graduated cylinder (front left), glass tumbler (front middle), iCelsius temperature probe (inside tumbler). Are the methods of cooling that don’t rely on melting (e.g. whisky stones, stainless steel cubes, or a well chilled glass) effective ways to chill whiskey? The results of our previous ice experiment showed a large difference between cubes and a sphere, that seems to be related to the amount of ice that melted during cooling. This would indicate that the phase change of water seems to absorb the majority of the heat, so I have serious doubts about the cooling ability of devices that do not melt. The high thermal conductivity of stainless steel may give it a slight advantage over the whiskey stones, but I doubt either will be able to match melting ice in terms of total calories of cooling. I expect the chilled glass to have the largest effect as the glass will only have to absorb heat from the whiskey, where the stones and stainless steel will have to absorb heat from both the whiskey and the glass. Place glass on kitchen scale and zero it. Place 3 whiskey stones into the glass, and record their mass. Place probe into glass away from the whiskey stones. Add 2 fl. oz. of whiskey to the glass. Record temperature until it stops going down (approximately 5 minutes according to the packaging). Swirl the drink (as recommended by the stainless steel cube packaging) to see if temperature resumes falling. Continue recording temperature until it stops decreasing again. Remove whiskey stones, mass them and return them to the glass. Repeat steps 1 through 8 using stainless steel cubes and a glass that has been chilled in the freezer. Repeat steps 1 through 9 using water instead of whiskey. Enjoy responsibly with fellow doers of science. Having collected all of the requisite data, we plotted the temperature over time for each of the cooling methods. Below is a graph of those cooling curves. The sudden up-tick at the end of each curve is due to the removal of the temperature probe from the whiskey. Cooling curves for whiskey stones (blue), stainless steel cubes (green) and a chilled glass (orange). Some of the curves in the plot appear to level off and then suddenly drop again. These drops are due to the swirling of the contents in step 6 of the procedure. The differences in initial starting temperature of the whiskey is peculiar. Our best guess is that the whiskey had been stored at a slightly higher temperature than that of the room we were conducting the tests in. To make sure the differences in temperature change weren’t due to huge differences in the size of the cubes, we also took several mass measurements. Those measurements, along with a summary of the temperature data is given below. As this table shows, the masses of the glasses were all very similar, as are the masses of the whiskey and the cubes used. While the steel cubes are in fact slightly bigger than the stones used, the difference with respect to the stones was not enough to account for the difference in temperature change (14.3ºF for the steel vs. 6.2ºF for the stone). This would indicate the the steel cubes have a much greater cooling capacity per unit mass than the stones. 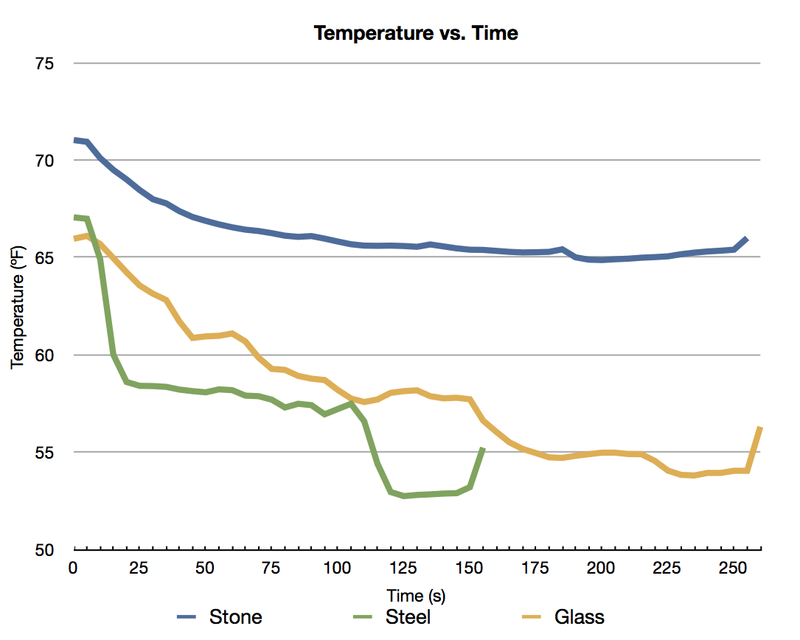 In fact when you consider the net degrees of cooling per gram of cold thing doing the cooling, the steel managed 0.18ºF per gram as opposed to only 0.08ºF/g for the stone and 0.038ºF/g for the glass. The glass overall did much better at cooling due to the huge difference in total mass. Which brings up an interesting question, what if the stones or the steel cubes didn’t have to fight the warm glass to cool the whiskey. If we combine to total cooling of the cubes and the cold glass we get 20.47ºF of cooling for stone plus the glass and 26.46ºF of cooling for steel plus the glass. Neither of these are as large as the temperature changes melting ice can cause in 3 fl. oz. of liquid as bourbon as opposed to the 2 fl. oz. used in this experiment. The effect of the swirling the glass, at least with the steel cubes and the chilled glass. Also the overall effectiveness of the chilled glass relative the whiskey stones was unexpected. If you want to chill whiskey more than just a few degrees, stainless steel cubes or a well chilled tumbler will do far better than whiskey stones. If on there other hand you prefer your whiskey slightly below ‘neat’, whiskey stones are the way to go. Of course if you want your whiskey ice cold, your best bet is to have it on rocks that melt or to store the whiskey in the freezer (space permitting), as Brownie Master P suggests. How would whiskey stones or stainless steel cubes do in keeping an already cool beverage cold? If whiskey stones or stainless steel cubes are used in conjunction, would there be a greater change than the simple addition done above? Hey! I got my MS from Michigan Tech. I was just wondering why these lame whiskey stones weren’t working. Now I know. Thanks! I’ll get the steel ones.Go Huskies! I’ve been reading many mixed reviews of whisky stones over the past several months and just recently found a very nice set of liquid-filled steel cubes. I definitely prefer my dram chilled below “neat”, sometimes with a drop of water, but your results are showing me that I’ll get what I want from these cubes without having to dilute my drink too much with ice.